Molaei, S., Cyrus, K. (2014). Robust Design of Maintenance Scheduling Considering Engineering Insurance Using Genetic Algorithm. International Journal of Research in Industrial Engineering, 3(1), 39-48. S. Molaei; K.M. Cyrus. "Robust Design of Maintenance Scheduling Considering Engineering Insurance Using Genetic Algorithm". 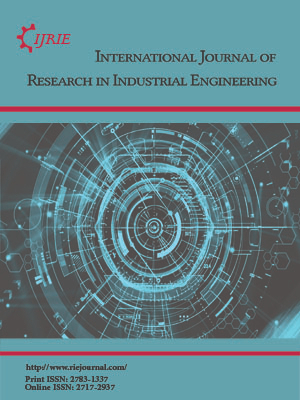 International Journal of Research in Industrial Engineering, 3, 1, 2014, 39-48. Molaei, S., Cyrus, K. (2014). 'Robust Design of Maintenance Scheduling Considering Engineering Insurance Using Genetic Algorithm', International Journal of Research in Industrial Engineering, 3(1), pp. 39-48. Molaei, S., Cyrus, K. Robust Design of Maintenance Scheduling Considering Engineering Insurance Using Genetic Algorithm. International Journal of Research in Industrial Engineering, 2014; 3(1): 39-48. Department of Industrial Engineering Amirkabir University of Technology, Tehran, Iran. Preventive maintenance is a broad term that encompasses a set of activities aimed at improving the overall reliability and availability of a system. Designers of the preventive maintenance schedules attempt to minimize the overall cost of system operation. There is no substitute for perfection in maintenance to ensure zero breakdowns in machine; therefore it is necessary to get a machinery breakdown insurance against the risks that might occur at business. Previous researches didn’t consider the effect of engineering insurance on maintenance scheduling while it affect the cost function of maintenance scheduling seriously. Engineering insurance pays for all repair costs of machinery, therefore the cost function of maintenance scheduling is affected. This paper presents a new cost function for maintenance scheduling by considering the effects of engineering insurance. Due to the uncertainty in the cost parameters related to the cost function which are very common in application, the paper proposed the application of the scenario-based approach for robust design of maintenance scheduling. Then, genetic algorithm is developed for obtaining the optimal solution of the proposed robust model and the effectiveness of this model is illustrated through a numerical example.